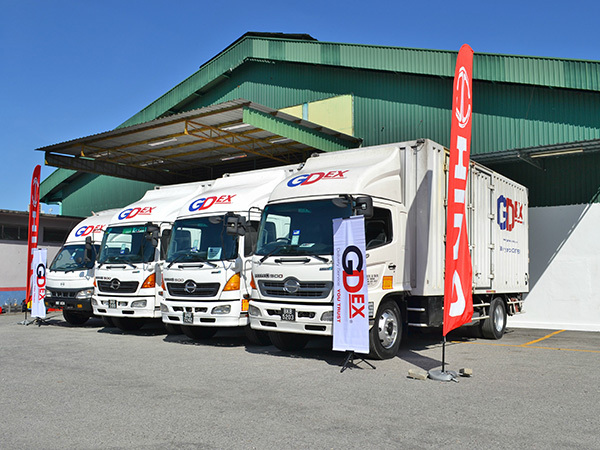 Selangor, 13 February 2018: Hino Motors Sales (Malaysia) Sdn Bhd – HMSM, a subsidiary of Hino Motors Limited Japan, associates under Toyota Group of Companies, kicking off their 2018 with 300 units of their best-seller, HINO 300 Series delivered to Malaysian renowned courier service company, GD Express Sdn Bhd (GDEX). Speaking of a good business relationship between HMSM and GDEX, last year HMSM received 200 units order of their newly launched HINO 300 Series from GDEX, that has proven that quality and durability of the products is inarguable. Up to date, total HINO vehicles in GDEX operations are 578 units which sum up 60% of their total fleet. Today, once again, HMSM is delighted to be given the opportunity and reliability when GDEX adds another 300 units of HINO trucks. The year 2017 has seen a drastic development of e-commerce sector in Malaysia. Quoting the Minister of Transport Malaysia, the country is expecting RM114 billion growths through e-commerce hub. Capitalising the e-commerce boom, this is one of the reasons that is empowering GDEX to step ahead of the curve by expanding 16 of their branches nationwide last year as well as increasing business operations volume. The steady growth of digital economy today forecast a wide demand to boost logistics businesses in Malaysia. HMSM and GDEX are keen to maintain the good relations to survive in the new competitive market digital economy. Recently, Hino Malaysia has secured their 2017 sales by achieving No. 1 sales in Light Commercial Vehicle (LCV 4-wheeler), Medium to Heavy Commercial Vehicle (MHCV) and Bus as reported by Malaysian Automotive Association (MAA). Hino is now looking forward to further success in 2018 and one of the essential focuses is on Hino Total Support. Completing their full product launches last year together with the opening of new Hino Total Support Customer Center (HTSCC) – Malaysia’s only training center for Commercial Vehicle industry and world’s 1st training circuit operated outside Japan hub, Hino Malaysia is positive to increase performance not only in Sales but also After-Sales Services. Capable of producing 10,000 vehicles and training several thousand drivers every year, HTSCC offers extended range of training courses. These courses include driver familiarization, eco-driving and safety-driving among others. HMSM today is glad to bring product quality to their customer, GDEX which contributes in minimizing vehicle downtime, reducing GDEX operational costs and giving them more exclusive warranty satisfaction such as the “Free Parts Program” and “Free Service Program” as well as other extras such as ‘Best-Fit’ program, ‘Free Service Campaign’ and more upcoming activities which could give customer added benefits after-sales. The signing ceremony attends by Mr. Ken Iwamoto together with the Managing Director and Chief Executive Officer of GDEX, Mr. Teong Teck Lean and witnessed by Encik Mohamed Zaidi Abdul Karim, Division Head of e-Commerce and Postal from Malaysian Communications and Multimedia Commission (MCMC); Mr. Masaki Yamauchi, President of Yamato Holdings; management team of GDEX and HMSM. HMSM also presents 4 Certificate of Reliability to GDEX on HINO trucks of their own that reach 1 million mileages without any engine overhaul. HINO continue to Aim for Customer Trust & Confidence. has agreed to acquire the commercial vehicle business of Mercedes-Benz Malaysia Sdn Bhd for an undisclosed sum. “The proposed acquisition enables the Hap Seng group to participate in the wholesale distribution of the Mercedes-Benz and Fuso commercial vehicles in the growing market in Malaysia,” it said in a filing with Bursa Malaysia yesterday. 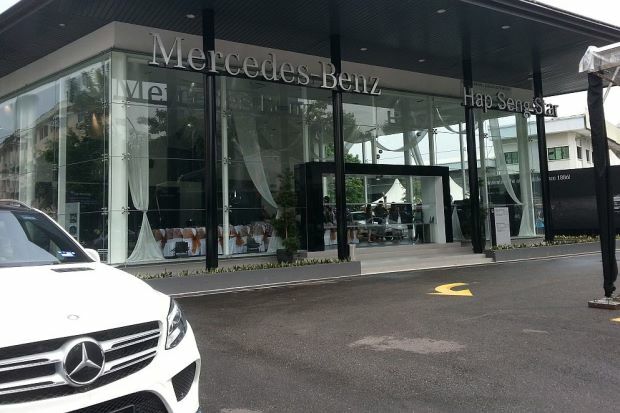 Hap Seng is an authorised dealer of Mercedes-Benz cars, with six Autohaus showrooms in the Klang Valley, Kota Kinabalu and Kuching. The acquisition, the company said, would further strengthen the group’s presence as a player for both passenger cars and commercial vehicles in Malaysia. 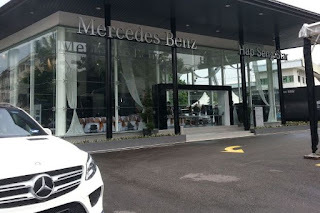 It will also run the operations of Mercedes-Benz Malaysia commercial vehicle training centre. Hap Seng Trucks is a wholly owned subsidiary of Hap Seng Consolidated Berhad, a public company listed on the Main Market of Bursa Malaysia Securities Berhad with market capitalisation of about RM23 billion. It is a diversified group with six core businesses – plantations, property investment and development, credit financing, automotive, fertilisers trading and building materials. OAKLAND, Calif. - Mack Trucks says it has some work to do in the western U.S., and in Canada, to build market share on the back of its new Anthem highway tractor. During a press event here Dec.